A street in Ho Chi Minh City’s District 4, long known as a top destination for foodies, particularly snail lovers, has been officially entitled a ‘food street,’ adding to the southern metropolis’ list of culinary havens. An opening ceremony for the Vinh Khanh Food Street was held on Friday night, with the presence of several local officials and a large crowd of foodies. Vinh Khanh is an S-shaped street, linking Ben Van Don and Ton Dan Streets in District 4. The whole thoroughfare now serves as the ‘food street’. District 4 deputy chairman Lam Tan Hung said that the successful launch of Vinh Khanh Street Food was credited to various efforts by local authorities. “The street food will help promote numerous local businesses and spur the social-economic development of District 4 in particular and Ho Chi Minh City in general,” the official said. Vinh Khanh Street has been home to dozens of small eateries, particularly those serving snails, for the past four years and known by countless customers across the city. 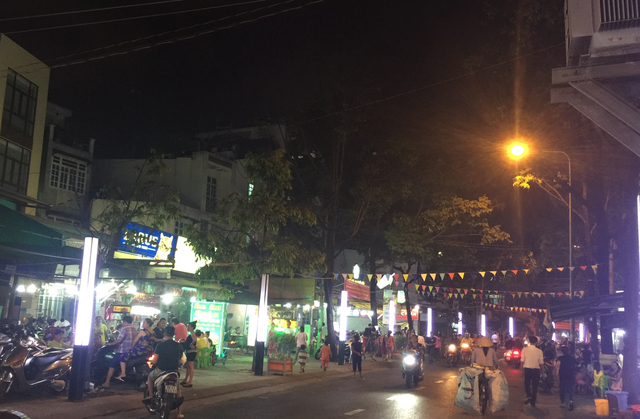 Officially naming Vinh Khanh as a “food street” will help popularize the place to many other people, both Vietnamese and foreigners, according to local authorities. The entitlement brings in many others benefits such as ensuring food safety standards, better regulating the selling prices, as well as improved security for customers. The place will offer various signature Vietnamese dishes, particularly a wide selection of dishes made from seashells. In August last year, the first “food street” in Ho Chi Minh City was launched on Nguyen Van Chiem Street in District 1. Not long after, Bach Tung Diep Park, also located in District 1, was chosen to host the city’s second culinary haven in October 2017.